My husband and I love caves. I’ve been to the Mammoth Caves in Kentucky, together we visited Luray Caverns in Virginia, and we’ve even been spelunking at Metcalfe Rock near Collingwood, Ontario. So we’ve seen a lot of crystal formations, stalactites, and stalagmites. We’ve never seen ones big enough to walk on like a bridge. Welcome back to my Unbelievable Real Life feature, where I showcase weird creatures and offbeat places on our planet that seem like they should belong in a fantasy or science fiction story. Today we’re going to the Crystal Cave of Giants in the Naica Mine in Chihuahua, Mexico. You’re close to 1,000 feet below the surface in this mine, and some of the gypsum crystals are four feet around (I’m only 5 foot 2 inches tall!) and 35 to 50 feet long (that’s the width of a high school basketball court). They can weigh up to 55 tons. After their discovery in 2000, the question became how did they get so big? 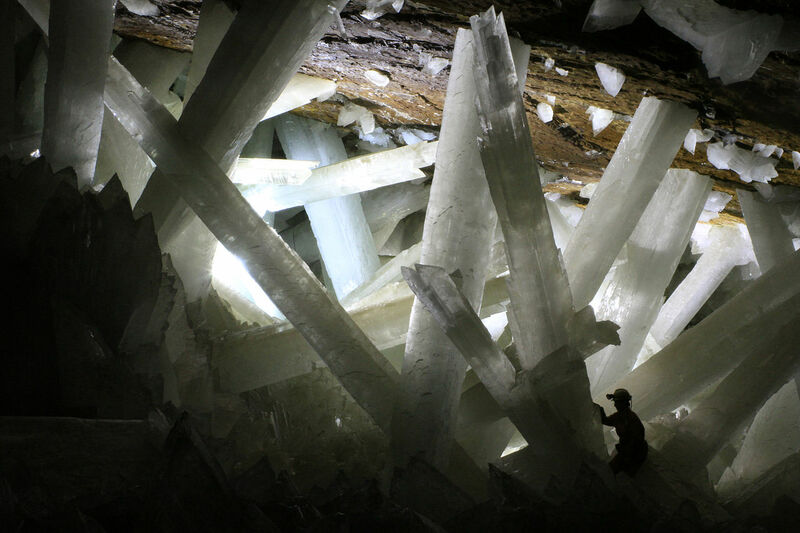 One of the geologists who discovered them studied tiny pockets of fluid inside the crystals and concluded that the caves were once filled with water that stayed at a stable temperature and was rich in minerals. The water is long gone, but the crystals that formed over thousands of years remain. Sadly these mines aren’t open to the public. Would you want to go if they were? Talk about amazing and beautiful!!! My first experience with a cave was in Kings Canyon National Park as a kid. What impressed me then was the effect of one match in dispelling the absolute darkness. The cave wasn’t that impressive per se, but the effect of the light from one little match was. I often thought about that experience in the context of fame and fortune–even if mine is insignificant, I can make a difference. I’ve also been to Luray–and another epiphany: I learned why I have trouble in crowded elevators! It’s not so much the enclosed space, but that I’m in an enclosed space with lots of people. It’s an unnamed phobia, I think, but I self-diagnosed it at Luray. In spite of the immensity of some of the rooms, our tour group was huge. Of course, the corollary to that epiphany is that I could never be a spelunker. I wonder if there are other people out there with a similar phobia, feeling alone because it has no name. At least now that you recognize it, you’ll know how to cope with it! I think it was in Meramec Caverns that I first experienced COMPLETE darkness. Some people felt very claustrophobic from it, but I thought it was cool. I’m sure I’d freak out after more than a minute or two, but for a short time, it’s just mind-boggling. Oh how I would love to make photos there! I’d go in a heartbeat if they’d let me. I wish you could too. Having seen some of your photos, I know the images you’d come away with would be spectacular. I’ve been to Mammoth Caves (KY) several time, Meramec Caverns (MO) more times than I can count, random caves around the country I couldn’t tell you the names of, salt mines, coal mines, and the grand-daddy Kartchner Caverns (AZ). 🙂 Yeah, I think it’s safe to say I think caves are cool. LOL! I would absolutely go to this place if I could. I’d never heard of it before–thanks so much for sharing! One of the few disappointments my husband and I had about our honeymoon was that we couldn’t make it to the Jenolan Caves (near Sydney) when we were in Australia. If we ever go back, it’s at the top of our list. I would absolutely want to go into that cave. I love caves. Carlsbad Caverns in New Mexico is probably the biggest cave I’ve ever been in and it is massive. Very cool video, Marcy. Crystals are fascinating. When the pictures of those caves appeared on the interwebz, I read that the mine was soon to be flooded and those dragon’s teeth (I’m firmly convinced they’re dragon’s teeth) would never be seen again.